Journey from airport delayed after the car sent for me had to detour due to a demonstration. I have booked into the Vatican Guest House,and visited the Head office of the Jesuits ans St Peter’s Square. Did a little shopping atthee Pope’s tailors. A pilgrims trail has also been prepared for pilgrims visiting St Mary’s Priory. The St Mary’s Priory Choir will sing at Llansantfraed’s Church at a Service in Honour of the Poet Henry Vaughan at 3pm on Sunday, April 29th. 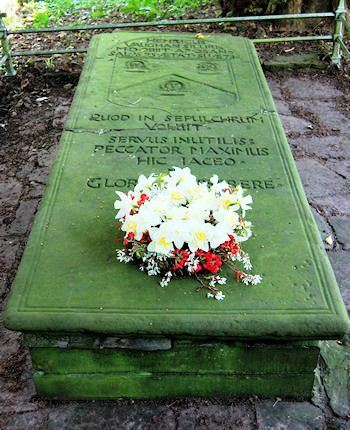 Henry Vaughan lived in the village most of his life and his buried in the churchyard. His Grandfather , William, owned Tretower Court. Both he and his twin Thomas were schooled locally by the rector of Llangattock, the Rev. Matthew Herbert. Archbishop Trench has proposed that “As a divine Vaughan may be inferior [to Herbert], but as a poet he is certainly superior”. Critics praise Vaughan’s use of literary elements. Vaughan’s use of monosyllables, long-drawn alliterations and his ability to compel the reader place Vaughan as “more than the equal of George Herbert”. Yet others say that the two are not even comparable, because Herbert is in fact the Master. While these critics admit that Henry Vaughan’s use of words can be superior to Herbert’s, they believe his poetry is, in fact, worse. Herbert’s profundity as well as consistency are said to be the key to his superiority. Than my strict yet welcome size. As if they could beauty spare. As is the case with many great writers and poets, Henry Vaughan was acclaimed less during his lifetime than after his death on April 23, 1695, aged 74. 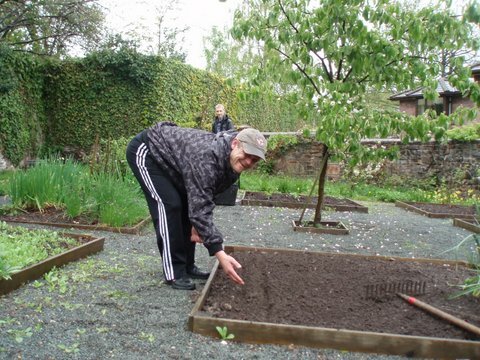 On the day HM The Queen visited Gwent volunteers in the Abbot’s Garden were planting lettuce seeds for the Big Jubilee Lunch on June 4th. Volunteers maintain this beautiful garden for the benefit of the public. In addition to vegetables and herbs we grow plants and flowers to enhance this tranquil space. The Magnificat bed contains a range of flowers named after the Blessed Virgin Mary: Our Lady’s Gloves, Rosemary, Lillium Regale, Our Lady’s Tears,Mary’s Gold, Our Lady’s Bells, Our Lady’s Modesty, Mystic Rose & Iris. The Herbert Chapel recess has wallflowers and forgot-me-nots, along with medieval & Tudor nosegays. In 2010 the Monmouthshire Wild Meadows Group planted a wild flowers area. We are pleased to host a Floral Demonstration on Thursday (April 26th) at 7.30pm in the aid of the NAFAS Three Counties Area Floral Festival at Brecon Cathedral entitled Gloria in August. Following the Easter Vestry last week today saw the new Wardens in their new role for the first time. Following the retirement of Sir Trefor Morris as Vicar’s Warden, Fr Mark appointed Robin Smith, Assistant People’s Warden to replace him. Fr Mark said, ” We are greatly indebted to Sir Trefor for all he has done to ensure the development of St Mary’s Priory site, I am please to appoint him Warden-emeritus as a mark of our gratitude. In Robin we have a person who I am sure will take over the baton from Sir Tefor”. Andrew Powell was re-appointed as Deputy Vicar’s Warden. The Vestry re-elected Mrs Sheila Davis as People’s Warden. The newly elected Deputy People’s Warden is David Williams.